This week, we examine the mystery surrounding the most infamous SAT problem of all time. Every local newspaper, it seems, is obligated to print at least one story per year decrying the SAT as a biased and invalid form of cruel and unusual punishment. These articles no doubt make for effective click bait. However, if you're familiar with the test, you'll immediately realize that these articles are generally 100% research-free. Many of the current criticisms point to alleged problems with previous versions of the SAT, and virtually all the articles rely too heavily on the questionable testimony of a few prominent anti-test advocates. Even now, a decade after the 2005 redesign of the SAT (the last update prior to the 2016 redesign), it's still not uncommon to read rehashed articles about the cultural bias of the analogy section of the SAT. That's right: the analogy section. The correct answer is (C) oarsman : regatta. At issue is the fact that the correct answer requires the knowledge of vocabulary words that are more likely to have come up in the daily lives of affluent white students than in the lives of less affluent minority students. This test question was famously dissected in the controversial 1994 book, The Bell Curve, by Herrnstein and Murray. 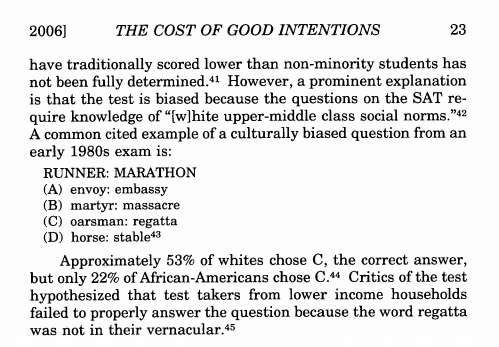 That Image is taken from Leslie Yalof Garfield, The Cost of Good Intentions: Why the Supreme Court's Decision Upholding Affirmative Action Admission Programs Is Detrimental to the Cause, 27 Pace L. Rev. 15 (2006) Available here: http://digitalcommons.pace.edu/plr/vol27/iss1/2. To be clear, I'm not commenting on Garfield's article or endorsing his claims. In fact, I haven't even read the paper in its entirety. I mention this because I was surprised to see that Garfield's exhaustively footnoted article from 2006 indicates that the infamous oarsman : regatta problem appeared on "an early 1980s exam." This information prompted me to search for hard evidence that the problem actually did show up on a test at some point in the 1990s. It's entirely possible that the College Board did reuse the question. In fact, some recent SAT tests have contained reused test items. Even so, Garfield doesn't seem to have been aware of any encore performances by the controversial question. During my research, I did find one other source that claimed the regatta question last sailed in 1973, but it was clearly biased and I could not confirm the accuracy of the article's claims. More to the point, it seems odd that the College Board would even consider reusing a test question that had been featured in a best selling book as evidence of standardized testing bias. Then again, the College Board has been rather tone def in its response to controversies in the past. After spending too much time on this mystery, I've yet to come across any evidence that the oarsman : regatta problem ever appeared on an SAT test during the 1990s. That is my tentative conclusion for now. Obviously, the best way to get to the bottom of this would be to review every SAT test from the 1990s. Unfortunately, I'm not among the eccentric collectors of 1990s SAT tests. So I'm appealing for help. If anyone reading this happens to have a hermetically sealed library of ancient SATs, please look over those scrolls and and let me know which SAT test(s) the problem actually appeared on. I'll be very grateful for your help. Updated 11/28/2017: If you're interested in the larger issues surrounding the difficulty of measuring general intelligence and the controversy that has plagued Charles Murray since the publication of The Bell Curve, you should immediately listen to Murray's interview from earlier this year on The Waking Up Podcast with Sam Harris. Regardless of your feelings about the issues, it's a fascinating interview. The Number One Predictor of Test Prep Score Improvement. Please take a moment to subscribe. You can be sure that we will never send you anything that we don't think you'll find useful or enjoy reading. Copyright 2005-2018 Clear Choice Learning Systems, Inc. All rights reserved. *SAT is a registered trademark of the College Board, which was not involved in the production of, and does not endorse, this product.